Over 40,000 acres, 1,200 miles of shoreline and 365 islands make Lake Vermilion a crappie, blue gill and sunfish fisherman's paradise. Long renowned as one of Minnesota's best pan fishing lakes, Lake Vermilion offers trophy potential crappies, blue gills and sunfish. Lake Vermilion Bluegill from Minnesota DNR research. The trap net catch of bluegill was 44.5 fish/net, well above the historic average. The bluegill catch was much higher on West Vermilion than East Vermilion reflecting a higher bluegill abundance in that lake basin. Trapnetted bluegill had a mean length of 5.6 inches, which is below the historical average.. The small average size was due to high numbers of fish in the 3-4 inch fish in the catch from the strong recent year class. The catch of bluegill over 8 inches was about average. 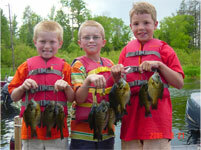 Bluegill fishing should be very good based on current information. Lake Vermilion Crappie from Minnesota DNR information. The most recent black crappie trap netting was slightly below the long term average. 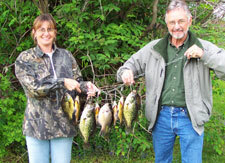 Crappie numbers have historically been fairly low on Vermilion with the exception of some areas on the west end. Trapnetted crappie had a mean length of 8 inches, slightly below the long term average. Above average numbers of small crappie were sampled from a recent strong year class. The catch of 8 inch crappie was also above average, reflecting a very strong earlier year class. The catch of crappie over 10 inches was below average. The healthy number of small crappie in recent years should yield good numbers of “keeper” crappies this season.